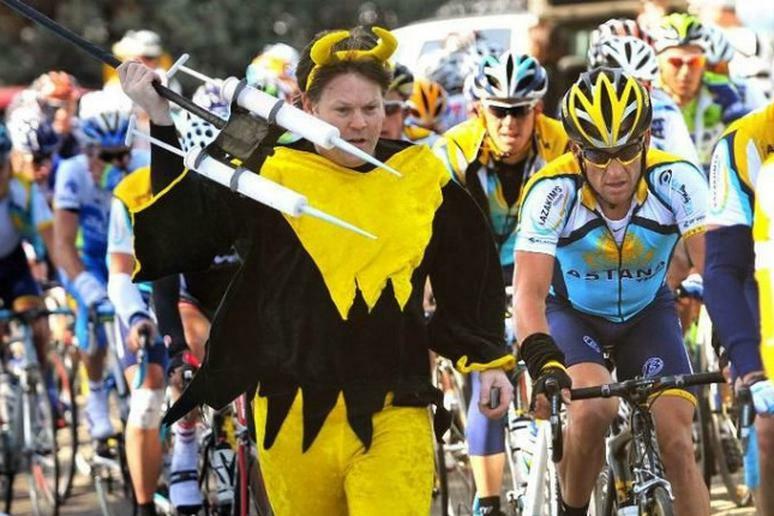 Lance Armstrong has been hounded by allegations of doping for his whole career—sometimes not so subtly, as seen here in the 2009 Tour of California. With the professional cycling world once again being rocked by an alleged doping scandal, this one involving Lance, the usual questions start to crop up: Why do cyclists dope? Will the sport ever recover from its addiction to performance-enhancing drugs? And, seriously, what is blood doping? For starters, drug use in cycling is northing new. French journalist Albert Londres famously interviewed the 1923 Tour de France winner Henri Pelissier and two other racers in what is some of the earliest recorded evidence of performance-enhancing drug use in the sport. "You have no idea what the Tour de France is," Henri said. "We suffer from the start to the end. You want to know how we keep going? Here..." He pulled a vial from his bag. "That's cocaine, for our eyes. This is chloroform, for our gums." "This," another rider said, emptying his shoulder bag "is liniment to put warmth back into our knees." "The truth,” said a third rider, “is that we keep going on dynamite." Cheating in professional competition—especially in professional cycling—is as old as sport itself. The winner of the inaugural 1903 Tour de France repeated his victory the following year, only to later be stripped of his title for cutting the course. And that was cheating the good old-fashioned way. Modern-day doping is far more nefarious in that it can be much more difficult to detect. It took more than a century until another Tour de France winner—American Floyd Landis in 2006—was stripped of a Tour title after testing positive for testosterone doping. Four years later, Spaniard Alberto Contador lost his 2010 Tour title after testing positive for clenbuterol, a bronchodilator (it opens up your bronchioles, allowing more air, and thus more oxygen, into your lungs) sometimes used to treat asthma patients, and more commonly used to treat respiratory disease in large farm animals (Contador claims to have eaten tainted steak before the race). So why does it seem like cyclists are always doping? Part of the reason is that cyclists are simply being tested more often than other athletes. In 2010, according to the World Anti-Doping Agency, cyclists failed 1.19 percent of doping tests, but triathletes did only slightly better, failing 1.09 percent of their tests. In other sports, weightlifters (2.42 percent), boxers (1.94 percent), and archers (1.47 percent) all failed at much higher rates than cyclists. Of course, those higher percentages represent far fewer doping cases, since pro cycling has become one of the most closely monitored sports, with top atletes being tested dozens of times a year. This was brought on by the Festina affair, which revealed widespread doping at the 1998 Tour de France. And those cases in cycling are much higher profile, thanks to big names at home (Lance Armstrong and Floyd Landis) and abroad (Alberto Contador and Alexander Vinokourov), than those in less popular sports. Can you name a top-tier archer? Or did you know about the doping crisis that has rocked cross-country skiing? That cycling is one of the few team endurance sports probably contributes to its doping culture. As British cyclist and disgraced doper David Millar outlines in his soon-to-be-released memoir Racing Through the Dark, there's plenty of pressure—both self-imposed and from peers—to take performance-enhancing drugs for personal glory ("I doped for money and glory in order to guarantee the continuation of my status. "), as well for the good of the team. In the case brought by the U.S. Anti-Doping Agency (USADA) against Lance Armstrong, it cites “a pervasive pattern of doping” that involves three team doctors and one of the sport's highest-profile team managers, Johann Bruyneel, and includes a chemistry textbook of offenses. If found guilty and stripped of his seven Tour wins, nine of the Tour’s last 13 races will have been tainted by doping. While most American sports fans are most familiar with doping in the context of Major League Baseball’s anabolic steroid crackdown (think: Mark McGuire and Sammy Sosa beefing up to shatter the sport’s home run records), doping in endurance sports relies on a whole other sort of chemical cocktail. 1. Erythopoietin (EPO). Also known as “E,” “Po,” “Edgar,” or “Edgar Allen Poe,” EPO increases the red blood cell count in an athlete’s bloodstream, which boosts his/her aerobic ability. The USADA reports it has multiple eye witnesses who saw team doctors administer EPO to athletes, including Lance Armstrong, between 1998 and 2005. 2. Blood transfusions. Sometimes called “blood doping,” this form of cheating involves the extraction, storage and pre-race re-injection of an athlete's own blood. Like EPO, blood doping increases an athlete’s aerobic ability by boosting red blood cell count. Blood doping is particularly difficult to detect, and no effective anti-doping test has yet been devised to identify when an athlete has recieved an illegal transfusion of his or her own blood. The best indicator of a transfusion right now is the presence of plasticizers from the IV bags used to store the blood (plasticizers were cited as anecdotal evidence against Alberto Contador, helping establish that he was doping). 3. Testosterone. This anabolic agent used to increase muscle mass and strength—and which, taken in smaller doses, promotes muscle recovery and increases endurance—was known on Lance’s USPS and Discovery Channel cycling teams as “oil” because, according to the USADA letter, a team doctor developed a method of mixing testosterone with olive oil, which could be delivered orally to racers. 4. Human Growth Hormone (hGH). According to the USADA letter, multiple riders of the USPS and Discovery Channel teams were given hGH to increase strength and lean muscle mass, and to assist in recovery after extreme exertion, both during training and during the Tour’s grueling 100-plus-mile stages. 5. Corticosteroids (aka: cortisone). This class of drugs is used to reduce inflammation, aid in recovery and provide a burst of energy and well-being. Although legal to treat localized injuries, the USADA alleges corticosteroids were improperly provided to racers by team doctors, and often used by Lance without medical authorization. 6. Saline and plasma infusions. In order to keep their mature red blood cell levels below the prescribed 50 percent limit (which would otherwise indicate evidence of EPO or blood doping) the USADA charges that riders used a prohibited technique of saline, plasma or glycerol infusions to mask elevated red blood cell counts. The USADA says it will present testimony from multiple riders concerning infusions given to numerous USPS riders, including Lance Armstrong.